1 Baht type 1 with the title "promise to pay"
1 Baht type 2 the title was change to "banknote is legal tender"
Type 1 ordinary number signature Supayok UNC about 9,100 - 10,300 baht. Type 1 ordinary number signature Supayok EF about 5,900 - 6,200 baht. Type 2 ordinary number signature Supayok UNC about 5,900 - 6,200 baht. Type 2 ordinary number signature Phraya Sri EF about 4,800 - 5,100 baht. Type 2 ordinary number signature Komarakul UNC about 3,000 - 3,100 baht. Type 2 ordinary number signature Mano UNC about 10,900 - 11,400 baht. Type 1 lucky number 1000000 signature Supayok VF about 14,200 - 14,900 baht. 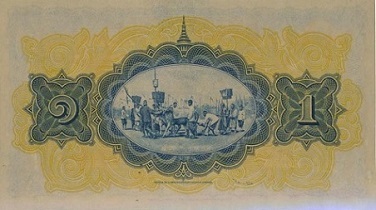 At the beginning the 1 baht banknotes were print with the title "Promise to pay to bearer on request in Siamese currency" that comply to the current currency act. Then the Temporary Currency Act was announced in 1918 to cancel the right to pay. 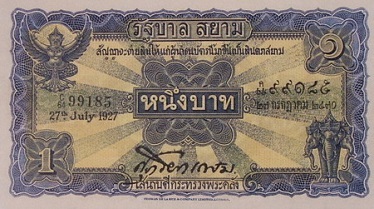 The 2nd series 1 Baht type 1 banknotes were announced on 21st July 1925. 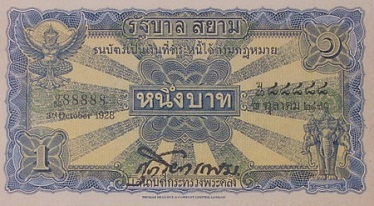 The 2nd series 1 Baht type 2 banknotes were announced on 19th Feb 1928. A 1 - A 100 , B 1 - B 100 , C 1 - C 100. The serial number run from 00001 - 100000. The face value banner is on guilloche design with twelve blue rays each of which was made up of the microprinted text Government of Siam written in Thai. The Roman alphabet and Arabic serial number is at upper left and the Thai alphabet and Thai serial number is at upper right with their own banknote dates.